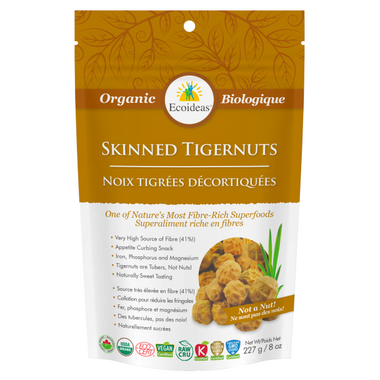 Tigernuts are RAW, Certified Organic, Gluten Free, and High Natural Source of Fibre. Chewy and slightly sweet flavour, like a nut. Soaked overnight they become softer and juicer. Great snack. Very tasty and nutritious snack. They are hard though. Not a lot of taste but filling and nutritious. Nice to add variety in diet. Very tasty, and definitely taste much like a nut. They are HARD though, so anyone with teeth problems would be better of with the sliced version. Great tasting nut alternative. They are full of fibre, I love these. Well worth the price. I love the taste of these. I am cutting out sugar and wheat from my diet and I find tigernuts to be quite sweet - tasting. I ground them in a spice grinder into a flour and mixed them with cinnamon and milk. I couldn't chew these. Too hard, even after hydrating for over 24 hours so I threw them away. I do like the ground tiger nut which has a very nice taste and welcome addition to my smoothie. I find that adding the ground tiger nut makes the smoothie more satisfying and curbs hunger. Definitely worth trying tiger nut, but unless you have strong teeth.